There have been many updates on the farm recently and one of the main projects we have under taken this year is rabbits! We now raise fully pedigreed Silver Fox rabbits for show and meat. We have 3 does and 1 buck in our rabbitry breeding program, housed in rabbit hutches we built ourselves equipped with a gravity fed watering system and solar powered cooling fans. Once litters are weaned from their mother we move them into a portable grow out tractor with an open slat bottom to allow them easy access to fresh grass and for waste to fall out. 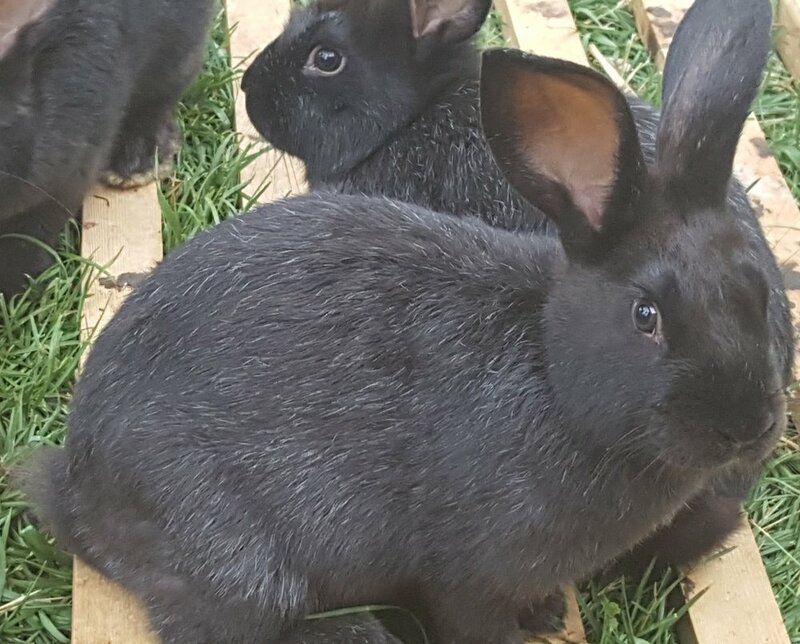 We chose to raise Silver Fox rabbits because they are excellent meat rabbits, Our daughter can show them at 4H and ARBA shows, and they are excellent fur bearers. Also Silver Fox rabbits are still a threatened breed of rabbits and we want to do our part to preserve this amazingly docile and interesting breed. We want to feed our rabbits the best feed we can and that why we only feed our rabbits from a local dealer of Rowe Nutrition Rabbit Feed from H&N Feed: Rowe Nutrition, LLC Dealers out of Central City, Iowa. Their feed is always fresh, and they deliver to many different cities. If you are looking for an amazing local source for feed and customer service that cant be beat we suggest you check them out on Facebook at the link above. In the US chicken eggs dominate the edible egg market so why should you consider duck eggs? For starters duck eggs are about twice the size, more nutritious with a richer creamy yolk, a thicker shell, and sometimes can be consumed by those who are allergic to chicken eggs. The flavor is only slightly different and we've been told by those who frequently buy farm fresh chicken eggs that our duck eggs taste like “a really good chicken eggs”. Duck eggs have a much bigger yolk, with a higher concentration of nutrients and more protein than the standard chicken eggs. Because of the the larger yolks, duck eggs are considerably higher in protein, fat, and cholesterol than chicken eggs with around double the concentration of omega-3 fatty acids. Besides that, duck eggs' nutritional profile is similar to chicken eggs. Because duck eggs have different protein make up than those from chickens, some people who experience allergic reactions to chicken eggs are unaffected by egg from ducks. Caution is still require as some may be affected by both and we advise you to speak with your medical professional before experimenting with duck eggs if you have an allergy to chicken eggs. Conversely there have been reports that some people are affected in the opposite fashion, able to ingest chicken eggs but react to other species of eggs such as duck, turkey, or goose. You can use duck eggs the same ways you can use chicken eggs. Our favorite way to cook duck eggs is over medium or as our daughter calls it “Dippy Eggs” with some toast to dip in the rich yolk. Because of the higher protein and smaller water content in duck eggs compared to chicken eggs, you need to be careful not to overcook them, which has a tendency to make them rubbery. We suggest you cook them a little slower or over slightly lower heat to prevent overcooking; but we don't have any problem cooking delicious tender eggs. The extra protein, higher fat, and albumen (egg white) makes for fluffier, richer baked goods and the yolk contains emulsifiers that help to form a thick, succulent batter that doesn't separate. We have made some incredible Creme Brulee with duck yolks and will share the recipe and cooking method with you in a future post. If you're interested in trying duck eggs we would love for you to try some from our free ranged pastured ducks located on our farm in Marion Iowa; just click on the contact us tab for details. Well guys it's been an exciting and trying time as we have gotten the coop ready for winter. In less than a week we have cleaned the coop, made a brooder, a rabbit stand,and 2 watering stations. We have also replaced all the bedding, and moved all the adult ducks into the coop. In less than 3 days we are expecting 66 golden 300 ducklings to arrive which we are all very excited about. As of right now we have 5 adult Muscovy ducks, 5 Muscovy ducklings, 5 Swedish ducks, 1 Indian runner duck, and 2 khaki Campbell ducks at our farm. We also have 4 Rabbits, 2 Guinea Pigs, and a dog.